The world’s best tribute to America’s favorite couple is available right here at Titan Creative Entertainment! 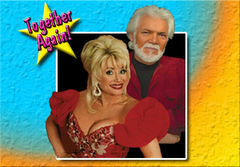 Dolly Parton and Kenny Rogers are one of the most popular and beloved vocal duos of all time and Sandy & Marty’s uncanny tribute to these country hall of famers can not be surpassed. Dolly Parton has had more top-10 albums (42) than anyone else. Sandy brings all the southern humor & charm as well as flamboyant dress & voluptuous figure that helped Dolly achieve her Grammy Award-winning, country music singer/songwriting and acting accolades to every one of her dazzling performances. With more than 70 hit singles across various music genres Kenny Rogers is a country music legend. Marty looks like, sings like, acts like and even talks like Kenny himself! Having given countless, worldwide performances over many years to rave reviews and bewildered audiences the only way to improve on his show was to share the stage with Sandy and make charismatic magic happen live, every night. Titan Creative Entertainment is extremely delighted to offer you a chance to experience the absolute best duo performance you will ever see … Sandy & Marty as Dolly & Kenny!